Love to build? I need YOUR HELP. Finish the city. Make it look fantastic; make it look great. Encoded mods to allow player interaction, such as buying from vendors or having paid player housing. Transport map into a randomly made, huge Primordial Desert map. Play! 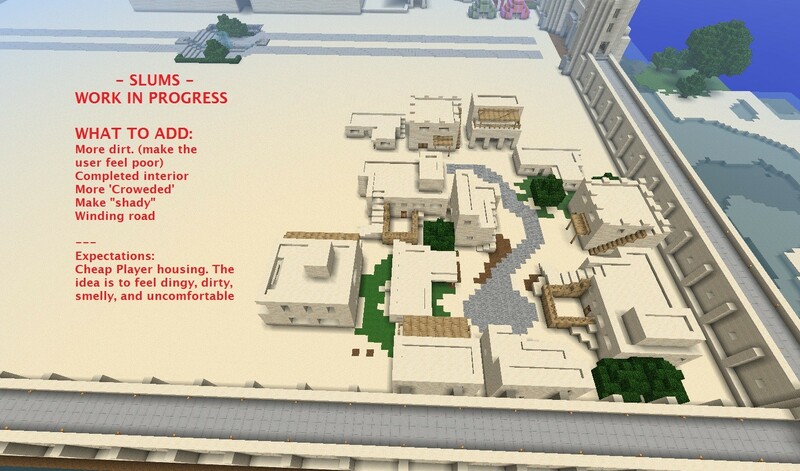 Users must rely on the city while exploring ruins, dunes, mountains, and more on a limited resource map. Players can start colonies outside the city once they get the right materials! I have a small 6 slot server up and running waiting for you. Before you can just run into the whole mess, I must make sure you check out and can be trusted to build the right type of buildings. This isn't some nilly-willy server where you can build a skyscraper and call it a day. Oh boy, oh boy. That just won't fly. We have to keep to a theme here. For starters, I highly advise you to go to google, look up "[Ancient] Middle Eastern/Arabic/Iraqi/Persian/Babylon Architecture/Houses/Buildings." (Not the whole thing at once! Do combos of those terms). 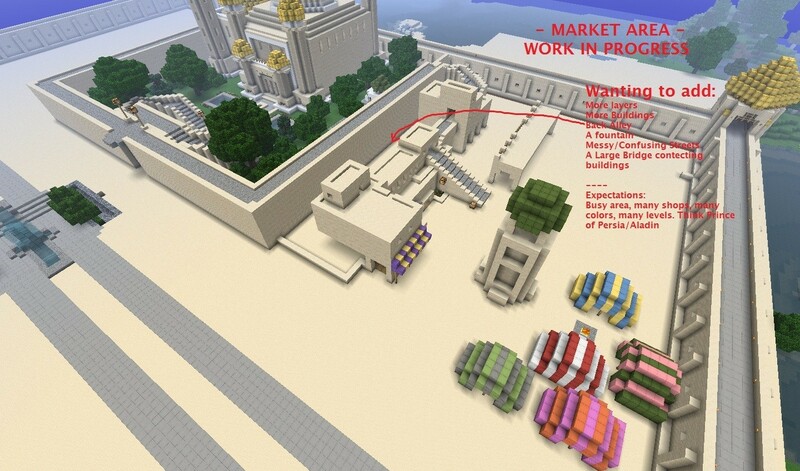 We are looking at old, desert buildings, with many levels of a city, many small rooms, staircases on the outside, arches, very 'square' looking, rooftop to rooftop-ish, very brown with colorful tents and banners. In fact, add the work "Arabian" to your application so I know you read what I am looking for. We use sandstone primary. You may spawn items. You may fly. 1. No Griefing. One drop of TNT, one ounce of lava = YEEEERRRR OUT! 2. Keep building in the theme! Sandstone, squares, cramped, busy, exciting! 3. Flying, spawning items is allowed. Once we make it to goal 3 (or T), they will not be allowed! 4. Use google images for inspirations. 6. No working in pockets. (I.e. build a tower here, build a mansion there.) NO NO NO. Layout your idea. Talk to me. Leave me messages on what you have planned to build. Random building will get you BANNED. Going outside the theme will get you BANNED. This is my baby. I want to see it through with you! Below, inside the pictures I have, I've included what I am looking for. READ THIS. UNDERSTAND THIS. GOOGLE IT FOR GUIDANCE. 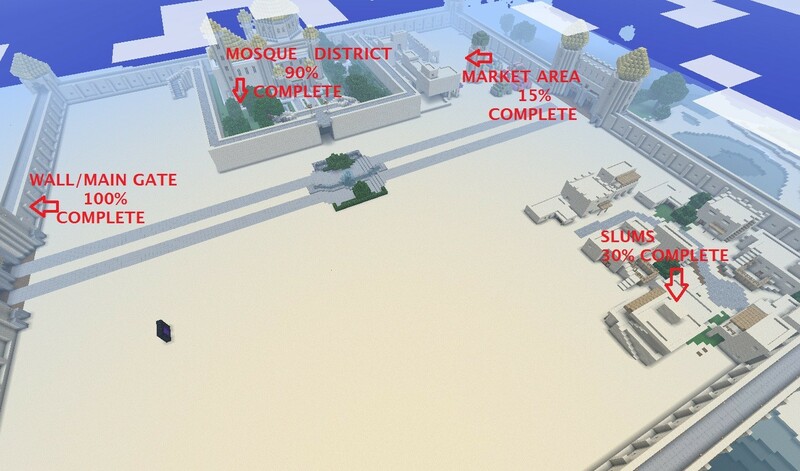 Please, if you're looking for a challenge, join me and my quest to finish this city. If you have any questions, please ask away. Server is up 24/7. Why Should I Accept You? 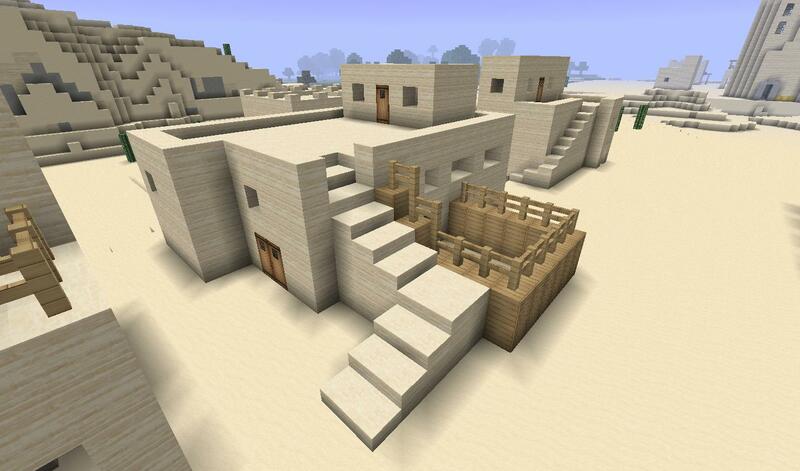 : Im good at building and i love the desert theme. Do I want to want the city to feel spacious? : Not really. Have street with this style   if you know what i mean. Additional info you would like to tell me? : Ive been mod 4 times and admin once and builder once. Iam good at world edit and world guard too. All rejected. Please re-read the post. I really want you all but I have to make sure you're serious. This is my child....I want you to help me father it. Why Should I Accept You? : Im a great, experienced builder. How long have you been playing Minecraft? : 8 months. Do you know how add levels to a city? : If i know what you mean then probably yes. Do you understand the theme? If so, what it is? : Yes, an Arabic theme, like the grand structures in Dubai. If you were to start now, what would you start building/working on? : The library or military barracks or bathhouse. Welcome, Chris! You've been added! I'll be on shortly. I am still looking up mods to use for the server. Take a look around!